GOUDEBO, Burkina Faso, Feb 22 2013 (IPS) - Fatimata Wallet Haibala sits among a group of women and teenage girls under a tent, her handicapped boy on her lap. The scene could be a rural picture of a Tuareg gathering in the desert. But the mother mother of five resides in a refugee camp in Goudebo, Burkina Faso, almost 100 kilometres from their home in Mali. “Life is harsher for women in the camp,” she tells IPS. “We have to take care of the family — men can walk around freely.” The widow makes money by re-selling to her fellow refugees the boxed milk and sugar that she buys from outside the camp. 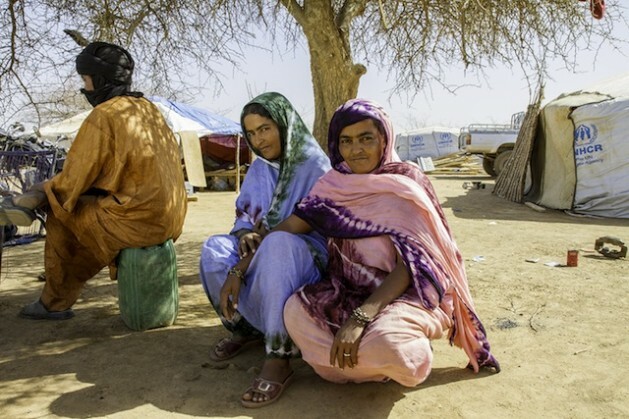 She has been here for more than a year now, escaping Mali before the crisis first hit in 2012. In early 2012, a rebellion saw the Tuareg – a traditionally nomadic community living across parts of Mali, Niger and Algeria– take over the north and nearly two-thirds of the country. But they did not hold the terrority for long. In April 2012, a coalition of armed Islamist groups allied with Al-Qaeda chased out the secular Tuareg-led National Movement for the Liberation of the Azawad. The coalition – composed of Al-Qaeda in Islamic Maghreb, the Movement for Unity and Jihad in West Africa (MUJWA), and Ansar Dine – was able to hold on the territory until a French intervention allowed the Malian army to reclaim the north last month. The crisis, so far, has created over 150,000 refugees in neighbouring countries – 40,000 in Burkina Faso alone – and 230,000 internally displaced persons within Mali. Every day, new refugees arrive at the camps. Most are “fair skinned” – Malian Arabs and Tuaregs. The late father of Haibala’s children, a Tuareg, was a soldier loyal to the Malian army who died fighting a rebellion in Agelhok in eastern Mali, last February. As soon as the rebellion came closer to her home, Haibala chose to leave. She arrived in the camp in February 2012, long before Islamists imposed Sharia law in the north. “In Gao, all “fair skin” left. Now, we hear that they hunt us – I don’t see the day yet when we will go back,” the 49-year-old woman says. Fresh attacks shook the town as recenlty as Thursday, Feb. 21., when the Malian army battled Islamists. The fear of retaliation from their communities back home is the main reason why they do not want return to Mali. Stories of attacks against light-skinned folks, true or false, are intertwined with the harsh memories of the Tuareg rebellions of the 1990s, during which the Malian army and paramilitary groups executed several Tuareg and Arab civilians. Recent statements from Human Rights Watch confirm that executions have been carried out by the country’s army on suspected Islamist rebels and supporters, but President Dioncounda Traoré denied the allegations on Feb.20. Meanwhile, the refugee women gathered under a tent in the camp to discuss rumours of rapes and killings. Though none of the women here have been witness to the atrocities, they have heard stories. “We know that some traders have been killed by the army at Gao’s market,” comments Fatma Targui. Further away, in another tent, Abou Haoula and some friends drink tea. Tradition prevails in Goudebo and men and women do not mix much here. The men arrived here in January from Gao. Some came by cars, some rode on the back of donkeys or camels. When they reached their country’s boarder with Burkina Faso, they were taken in by the United Nations Refugee Agency. “We fled because of the bombings and fighting – that was just too much. A lost bullet could have hit us … We had to leave,” explains Haoula, who is in his fifties. He says that, from the time of the Islamist invasion untill the bombings, they had been able to receive a steady delivery of food from Algeria and from Bamako. After the French launched the first bombings in January, all life and the deliveries of needed supplies stopped. It is only then that Hauola and other refugees left. “The MUJWA was harsh, but they left us alone if we complied by the rules,” Amidy Ag Habo, tells IPS. Back home, he was the deputy mayor of N’takala, a small town 60 kilometres outside of Gao. “We did not know the Islamists. They were foreigners,” he adds, but still, the “fair skinned” are perceived as allies to the MUJWA in Gao. The Goudebo refugee camp lies in an arid region. Here, NGOs had to dig water holes and build basic infrastructure to meet the needs of some 7,444 refugees who had to be relocated here in January. Fears that fighting from Mali would spill across the border and kidnapping threats were some of the reasons why authorities relocated the camp. Inspite of the harsh conditions, Haoula is relieved to be here. “Now, we are able to sleep tight. I was not able to close an eye in Mali,” he says. The men, still dressed in their Tuareg headscarves, share the feeling that it is most likely payback time in Gao. “There is no government in northern Mali now. All decisions are taken by the military. They are the police, the judges, and the government. The French do not kill. They simply disregard what the Malian army is doing,” says Habo. For Fatou Wallet Mahadi, the Islamists were a lesser evil compared to the Malian army. “There is no Mali without Azawad. We, Tuaregs of the Azawad, now belong to Mali. We trust that one day we will be able to go back. But right now it is impossible. There are too many tensions. We are tired of violence erupting every 10 years. When we go back, we need to work on a real solution to live together,” she says.